Amid constant shelling by the Saudi-led coalition, Yemen is struggling to import even essentials such as food and water, with a UN-imposed arms blockade on Houthi fighters interrupting any deliveries to the country. Speaking at UN Security Council closed-door consultations on the crisis in Yemen, the United Nations envoy to Yemen warned that UN arms embargo targeting the Houthis is having a collateral impact on aid deliveries. “Implementation of the new targeted arms embargo ... could inadvertently restrict the flow of much-needed commercial goods and humanitarian assistance to Yemen, including food, fuel and medical supplies,” Jamal Benomar told reporters after the briefing. Around 10 vessels containing food supplies for Yemen are still waiting to enter the country’s ports, as many Yemeni sea outlets are now being cut off by Saudis who refuse to allow any international vessels to dock in Houthi-controlled areas. According to the UN, the number includes three ships awaiting clearance at Hodeida, with one carrying 13,500 tonnes of rice. Another six ships carrying fuel, corn and construction products are awaiting clearance from the coalition to dock at the nearby Salifa port. Yemen which imports more than 90 percent of its food, mainly by sea, has been struggling to feed the population for weeks. Earlier this month, Reuters reported that at least five merchant ships were not allowed to pass. Only two or three of those vessels have been able to offload their cargo, ship tracking data and shipping sources told Reuters. “Ships with wheat need to wait up to five days for permission to enter. Several seem to be delayed,” a German commodities trade source told the news agency. Aid deliveries have also been hindered by the Saudis who have now been engaging the Houthi forces from the air for over a month now. Two Iranian cargo planes headed for Yemen were forced to turn back by Saudi Arabia last week. On Friday Iran’s Foreign Ministry summoned Saudi Arabia’s chargé d'affaires in Tehran to express its protest over the move. “We consider all options for helping the Yemeni people and immediate dispatch of humanitarian aid and transfer of the injured,” Iran’s Deputy Foreign Minister for Arab and African Affairs Hossein Amir-Abdollahian said on Sunday. The food that does eventually enter the war-torn country is being moved slowly around Yemen as shortages of fuel continues, United Nations’ World Food Programme said. With a price tag of $10 per liter of petrol, hospitals are suffering the worst, with the UN humanitarian agency OCHA warning that fuel supplies to generate powers will dwindle for one more week before running out in two weeks time. Prices for wheat products have also skyrocketed in the country and have risen by more than 40 percent since February. Medicine prices have risen by more than 300 percent, the UN said. The humanitarian situation in Yemen has become catastrophic, humanitarian agencies said on Monday, as over 12 million people need help, according to UN figures. 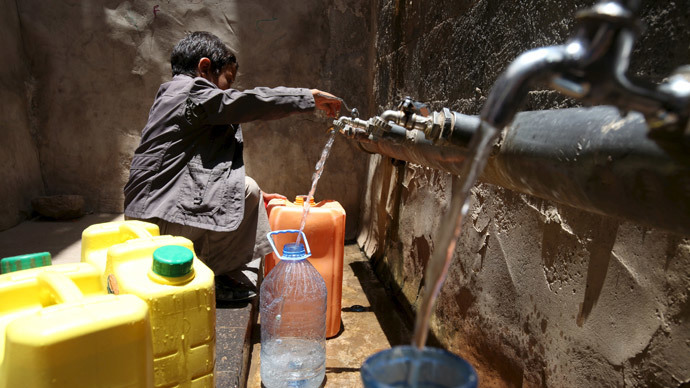 The lack of safe drinking water supply is also becoming a widespread problem in Yemen, a country of vast sand dunes and dessert. “There’s a consensus on water sharing across the Middle East – since water is generally pretty scarce there. President Hadi cut the water budget by 70 percent and that was one of the many decisions that created the sentiment against him,” Danny Makki of the Syrian Youth Movement, told RT. Meanwhile Yemen’s exiled government of President Ali Abdullah Saleh declared three areas in Yemen as “disaster” zone. Yemeni Human Rights Minister Izzedine al-Asbahi proclaimed that fighting in the country has “turned Yemen back 100 years,” due to the destruction of infrastructure. Provinces of Aden, Dhalea and Taiz, have suffered the most, al-Asbahi told a news conference in the Saudi capital Riyadh. Since the Saudi-led bombings started on March 26, more than 1,000 people, including an estimated 551 civilians have been killed, the United Nations said last week. UNICEF said at least 115 children were among the dead. “The impact on civilians is the major concern – a bombing campaign has been happening for over a month, and a hundred of killed civilians are children,” Joe Stork from Human Rights Watch told RT. Commenting on Monday's UN Security Council meeting, Russia's UN envoy, Vitaly Churkin said that the warring parties have agreed on some measures in resolving the conflict. “They [the warring parties in Yemen] agreed on a whole series of arrangements for settling the political crisis. The only remaining issue was the way the collective leadership would be structured,” Churkin told reporters. Last Tuesday, Saudi Arabia said the first phase of the campaign, codenamed operation Decisive Storm, had achieved all of its goals and was concluded. The new phase, operation Restoring Hope, was announced with a focus on diplomacy, but didn’t rule out new airstrikes. Less than 24 hours later, airstrikes resumed with fighting continuing until this day.